Low Stress Handling® University will be offering three levels of certification in Low Stress Handling®. Certification requires that each individual take all 10 lecture and lab courses in the pre-determined order. The classes are taken online, via an easy-to-use portal. After each lecture, the individual takes an online multiple-choice examination. Grades will be displayed as soon as each quiz is completed. If the student does not pass a quiz the first time, the quiz may be retaken until a score of 90% or better has been attained. Each quiz must be passed with a 90% or better in order to move on to the next module. 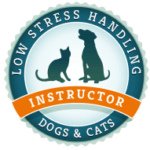 After passing all 10 multiple-choice quizzes and a final multiple-choice exam, scoring 90% correct or higher, the individual receives Certification in Low Stress Handling®, Silver-Level. This program is open to all individuals, including Veterinarians, Veterinary Technicians, all other clinical staff, Veterinary and Veterinary technician students, Groomers, Dog Trainers, Animal Rescue workers, shelter staff, and companion animal owners. Individuals that have achieved Silver-Level Certification can progress to Gold-Level Certification through rigorous personalized assessment of their hands-on skills. Hospitals can achieve Gold-Level Certification if they have employees who have achieved Gold and Instructor-Level Certification such that they can lead the hospital through the Hospital Certification process. Individuals who have received Gold-Level Certification can take it one step further and learn how to officially pass the knowledge on to others in an accurate and efficient manner. 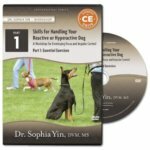 At this level, individuals gain the credibility to work as consultants teaching lectures, labs, and other forms of staff training. They will have the full ability to lead hospitals and businesses through the development and ongoing improvement of their business-wide Low Stress Handling® plan.